1 D None No Power Seat 1 D has slightly more legroom, but some still find the bulkhead wall restrictive. There is no floor storage for this seat. Meal service starts at the front of this cabin, so you should get your first choice. 1 F None No Power Seat 1 F has slightly more legroom, but some still find the bulkhead wall restrictive. There is no floor storage for this seat. Meal service starts at the front of this cabin, so you should get your first choice. 12 A None No Power Seat 12 A is designated by Air Canada as a Preferred Seat. An extra surcharge must be paid to reserve this seat. This seat is the first row of Economy with slightly reduced legroom; however passengers here will be first to be served and to disembark. Elite level members in Air Canada's Aeroplan program may reserve this seat without charge. 12 B None No Power Seat 12 B is designated by Air Canada as a Preferred Seat. An extra surcharge must be paid to reserve this seat. This seat is the first row of Economy with slightly reduced legroom; however passengers here will be first to be served and to disembark. Elite level members in Air Canada's Aeroplan program may reserve this seat without charge. 12 C None No Power Seat 12 C is designated by Air Canada as a Preferred Seat. An extra surcharge must be paid to reserve this seat. This seat is the first row of Economy with slightly reduced legroom; however passengers here will be first to be served and to disembark. Elite level members in Air Canada's Aeroplan program may reserve this seat without charge. 12 D None No Power Seat 12 D is designated by Air Canada as a Preferred Seat. An extra surcharge must be paid to reserve this seat. This seat is the first row of Economy with slightly reduced legroom; however passengers here will be first to be served and to disembark. Elite level members in Air Canada's Aeroplan program may reserve this seat without charge. 12 E None No Power Seat 12 E is designated by Air Canada as a Preferred Seat. An extra surcharge must be paid to reserve this seat. This seat is the first row of Economy with slightly reduced legroom; however passengers here will be first to be served and to disembark. Elite level members in Air Canada's Aeroplan program may reserve this seat without charge. 12 F None No Power Seat 12 F is designated by Air Canada as a Preferred Seat. An extra surcharge must be paid to reserve this seat. This seat is the first row of Economy with slightly reduced legroom; however passengers here will be first to be served and to disembark. Elite level members in Air Canada's Aeroplan program may reserve this seat without charge. 13 A None No Power Seat 13 A is an Economy seat that is designated by Air Canada as a Preferred Seat. An extra surcharge must be paid to reserve this seat. Elite level members in Air Canada's Aeroplan program may reserve this seat without charge. 13 B None No Power Seat 13 B is an Economy seat that is designated by Air Canada as a Preferred Seat. An extra surcharge must be paid to reserve this seat. Elite level members in Air Canada's Aeroplan program may reserve this seat without charge. 13 C None No Power Seat 13 C is an Economy seat that is designated by Air Canada as a Preferred Seat. An extra surcharge must be paid to reserve this seat. Elite level members in Air Canada's Aeroplan program may reserve this seat without charge. 13 D None No Power Seat 13 D is an Economy seat that is designated by Air Canada as a Preferred Seat. An extra surcharge must be paid to reserve this seat. Elite level members in Air Canada's Aeroplan program may reserve this seat without charge. 13 E None No Power Seat 13 E is an Economy seat that is designated by Air Canada as a Preferred Seat. An extra surcharge must be paid to reserve this seat. Elite level members in Air Canada's Aeroplan program may reserve this seat without charge. 13 F None No Power Seat 13 F is an Economy seat that is designated by Air Canada as a Preferred Seat. An extra surcharge must be paid to reserve this seat. Elite level members in Air Canada's Aeroplan program may reserve this seat without charge. 14 A None No Power Seat 14 A is an Economy seat that is designated by Air Canada as a Preferred Seat. An extra surcharge must be paid to reserve this seat. Elite level members in Air Canada's Aeroplan program may reserve this seat without charge. 14 B None No Power Seat 14 B is an Economy seat that is designated by Air Canada as a Preferred Seat. An extra surcharge must be paid to reserve this seat. Elite level members in Air Canada's Aeroplan program may reserve this seat without charge. 14 C None No Power Seat 14 C is an Economy seat that is designated by Air Canada as a Preferred Seat. An extra surcharge must be paid to reserve this seat. Elite level members in Air Canada's Aeroplan program may reserve this seat without charge. 14 D None No Power Seat 14 D is an Economy seat that is designated by Air Canada as a Preferred Seat. An extra surcharge must be paid to reserve this seat. Elite level members in Air Canada's Aeroplan program may reserve this seat without charge. 14 E None No Power Seat 14 E is an Economy seat that is designated by Air Canada as a Preferred Seat. An extra surcharge must be paid to reserve this seat. Elite level members in Air Canada's Aeroplan program may reserve this seat without charge. 14 F None No Power Seat 14 F is an Economy seat that is designated by Air Canada as a Preferred Seat. An extra surcharge must be paid to reserve this seat. Elite level members in Air Canada's Aeroplan program may reserve this seat without charge. 15 A None No Power Seat 15 A is an Economy seat that is designated by Air Canada as a Preferred Seat. An extra surcharge must be paid to reserve this seat. Elite level members in Air Canada's Aeroplan program may reserve this seat without charge. 15 B None No Power Seat 15 B is an Economy seat that is designated by Air Canada as a Preferred Seat. An extra surcharge must be paid to reserve this seat. Elite level members in Air Canada's Aeroplan program may reserve this seat without charge. 15 C None No Power Seat 15 C is an Economy seat that is designated by Air Canada as a Preferred Seat. An extra surcharge must be paid to reserve this seat. Elite level members in Air Canada's Aeroplan program may reserve this seat without charge. 15 D None No Power Seat 15 D is an Economy seat that is designated by Air Canada as a Preferred Seat. An extra surcharge must be paid to reserve this seat. Elite level members in Air Canada's Aeroplan program may reserve this seat without charge. 15 E None No Power Seat 15 E is an Economy seat that is designated by Air Canada as a Preferred Seat. An extra surcharge must be paid to reserve this seat. Elite level members in Air Canada's Aeroplan program may reserve this seat without charge. 15 F None No Power Seat 15 F is an Economy seat that is designated by Air Canada as a Preferred Seat. An extra surcharge must be paid to reserve this seat. Elite level members in Air Canada's Aeroplan program may reserve this seat without charge. 16 A None No Power Seat 16 A has limited recline due to the exit behind. 16 B None No Power Seat 16 B has limited recline due to the exit behind. 16 C None No Power Seat 16 C has limited recline due to the exit behind. 16 D None No Power Seat 16 D has limited recline due to the exit behind. 16 E None No Power Seat 16 E has limited recline due to the exit behind. 16 F None No Power Seat 16 F has limited recline due to the exit behind. 17 A None No Power Seat 17 A is designated by Air Canada as a Preferred Seat. An extra surcharge must be paid to reserve this seat. Elite level members in Air Canada's Aeroplan program may reserve this seat without charge. This seat does not recline and is missing an armrest. 17 B None No Power Seat 17 B is designated by Air Canada as a Preferred Seat. An extra surcharge must be paid to reserve this seat. Elite level members in Air Canada's Aeroplan program may reserve this seat without charge. This seat does not recline. 17 C None No Power Seat 17 C is designated by Air Canada as a Preferred Seat. An extra surcharge must be paid to reserve this seat. Elite level members in Air Canada's Aeroplan program may reserve this seat without charge. This seat does not recline. 17 D None No Power Seat 17 D is designated by Air Canada as a Preferred Seat. An extra surcharge must be paid to reserve this seat. Elite level members in Air Canada's Aeroplan program may reserve this seat without charge. This seat does not recline. 17 E None No Power Seat 17 E is designated by Air Canada as a Preferred Seat. An extra surcharge must be paid to reserve this seat. Elite level members in Air Canada's Aeroplan program may reserve this seat without charge. This seat does not recline. 17 F None No Power Seat 17 F is designated by Air Canada as a Preferred Seat. An extra surcharge must be paid to reserve this seat. Elite level members in Air Canada's Aeroplan program may reserve this seat without charge. This seat does not recline and is missing an armrest. 18 A None No Power Seat 18 A is an Economy Class Exit Row seat with extra legroom that is designated by Air Canada as a Preferred Seat. An extra surcharge must be paid to reserve this seat. Elite level members in Air Canada's Aeroplan program may reserve this seat without charge. This seat is missing an armrest at the window. 18 B None No Power Seat 18 B is an Economy Class Exit Row seat with extra legroom that is designated by Air Canada as a Preferred Seat. An extra surcharge must be paid to reserve this seat. Elite level members in Air Canada's Aeroplan program may reserve this seat without charge. 18 C None No Power Seat 18 C is an Economy Class Exit Row seat with extra legroom that is designated by Air Canada as a Preferred Seat. An extra surcharge must be paid to reserve this seat. Elite level members in Air Canada's Aeroplan program may reserve this seat without charge. 18 D None No Power Seat 18 D is an Economy Class Exit Row seat with extra legroom that is designated by Air Canada as a Preferred Seat. An extra surcharge must be paid to reserve this seat. Elite level members in Air Canada's Aeroplan program may reserve this seat without charge. 18 E None No Power Seat 18 E is an Economy Class Exit Row seat with extra legroom that is designated by Air Canada as a Preferred Seat. An extra surcharge must be paid to reserve this seat. Elite level members in Air Canada's Aeroplan program may reserve this seat without charge. 18 F None No Power Seat 18 F is an Economy Class Exit Row seat with extra legroom that is designated by Air Canada as a Preferred Seat. An extra surcharge must be paid to reserve this seat. Elite level members in Air Canada's Aeroplan program may reserve this seat without charge. This seat is missing an armrest at the window. 2 A None No Power Seat 2 A has slightly more legroom. There is a small compartment under the closet in front of this seat to store your bags. The personal TV and controls are on the bulkhead wall, which can be difficult to reach. 2 C None No Power Seat 2 C has slightly more legroom. There is a small compartment under the closet in front of this seat to store your bags. The personal TV and controls are on the bulkhead wall, which can be difficult to reach. 31 C None No Power Seat 31 C is a standard Economy seat, however, the proximity to the lavatories and galley may be bothersome. 31 D None No Power Seat 31 D is a standard Economy seat, however, the proximity to the lavatories and galley may be bothersome. 32 C None No Power Seat 32 C is a standard Economy seat, however, the proximity to the lavatories and galley may be bothersome. 32 D None No Power Seat 32 D is a standard Economy seat, however, the proximity to the lavatories and galley may be bothersome. 33 A None No Power Seat 33 A has slightly less seat pitch and has limited recline. The proximity to the lavatories and galley may be bothersome. 33 B None No Power Seat 33 B has slightly less seat pitch and has limited recline. The proximity to the lavatories and galley may be bothersome. 33 C None No Power Seat 33 C has slightly less seat pitch and has limited recline. The proximity to the lavatories and galley may be bothersome. 33 D None No Power Seat 33 D has slightly less seat pitch and has limited recline. The proximity to the lavatories and galley may be bothersome. 33 E None No Power Seat 33 E has slightly less seat pitch and has limited recline. The proximity to the lavatories and galley may be bothersome. 33 F None No Power Seat 33 F has slightly less seat pitch and has limited recline. The proximity to the lavatories and galley may be bothersome. The updated aircraft feature in-seat Audio Video OnDemand (AVOD) including 50 hours of audio. If you are flying on a plane that hasn't been updated, you will have 12 channels of audio entertainment. Air Canada is in the process of updating all seats on this aircraft with personal televisions. The updated aircraft feature in-seat Audio Video OnDemand (AVOD) including 80 hours of video. If you are flying on a plane that hasn't been updated, there are LCD screens that drop from the ceiling every three rows. Movies are shown on flights longer than 4.5 hours, short subject programming (TV shows) is shown on shorter flights. Air Canada is in the process of installing WiFi on their A320s. Some aircraft may not have it at this time. This is Air Canada's newest configuration of the A320. Window placement means its hard to sleep against the window here because your head lines up with the window indentation. Preferred seat but armrests are not movable. Comfortable seat with decent seat back entertainment system. These 320's fly nicer, quieter, and land smoother than a Boeing 737-800. Good, spacious exit row seat on this AC A320. Plenty of legroom but seat is rather tired and IFE isnt always reliable. Fine for the hop from Toronto-New York. While it is true that there is a space under the closet in front of you to store your bags on the floor if you want, it is off center of your seat so the leg room is not really improved over the other seats. I would recommend seat 2A as the better seat if looking for extra space to stretch. There is no seat in front of you, it is the armrest between first class seats so there is NO screen for tv or movies and no onboard Wifi. Seat should be RED. I booked an aisle in the exit row and AC bumped me to a window. I paid for an aisle, they bumped me to a window. Told the plane was full and no change possible. So the plus is aisle 12 gets off pretty darn quick, being right behind biz, and the legroom is OK, but not happy about the "no consent" bump. Excellent. Paid the fee for the exit row on a two-thirds full flight and got the whole row. Plenty of legroom, friendly crew. YVR to SFO is only two hours, so no hardship. Not a fan of the A320 but with a little extra room it's OK.
Good seat, decent view, average legroom. I believe the seat was great, would probably sit in rows 20 and below, as it seemed that deplane time was significantly less between the five rows ahead of me and my row. This seat was very comfortable, the plane was delayed so in total I was in the seat for 6 hours. Tons of leg room for someone like me who is 5"8. Plane did have wifi. You can easily see out of the window. The plane felt super clean and the flight attendant was nice handing out free earbuds for the delays. Screens worked good but headphone jack did not so for a 4-hour flight i couldn't not watch any movies. Row 12's middle seat does have IFE. It's tuck into the armrest and you have to pull it out of there. Theres no divide with the first class seats in front of me. The good news is that theres storage underneath the seat in front of me. I read about the slightly reduced legroom, while probably true compared to row 13, it is adequate. Don't sit in the middle seats if you want IFE. The seats in this airplane are the most uncomfortable I have ever sat in. They are poorly designed, it feels like there is a hole in the middle of the seat with minimal padding. No lumbar support. You cannot get comfortable; you start fidgeting within less than an hour. After only a 3-4 hour flight, you are stiff and sore. Flew AC578 from Calgary to Los Angeles on May 19, 2017. Great seat, loved the extra recline and legroom. Food was hot and tasty, the FAs were very kind and attentive, IFE worked flawlessly, and to top it off, witnessed a beautiful sunset mid-meal. All I could ask is that the curtain between economy and business cabins be extended to the wall on both sides, not just across the aisle. Overall, stellar service by AC, and really looking forward to flying with them again. Good seats but seats in rows 13 to 15 would be better (not extra legroom for row 12 compared to 13 to 15 and fixed armrests). Our family (2 Adults a Child and in Infant in Lap) recently travelled on Air Canada. We bought standard economy tickets but on both legs were issued boarding passes for Preferred Economy. It was a great treat. There is bags of legroom in these seats and the onboard entertainment selection and service was great. We had 13ABC and 14ABC on this trip, very pleased! Thanks AC! he thing that I don't like about this row is the fixed armrests. Since there are only two business class seats in front there are only two TVs, and no tables to fold down. So each seat has a table in one armrest plus the person in the middle has a TV in the other armrest. Making for decreased width in seat which is uncomfortable. Row 12 in the preferred section gets a bad rap but I'm currently sitting in 12D much happier than I thought I would be. I'm 5'10" and I have plenty of legroom, no disturbing curtain in front of me. Legroom and space is so ample that in spite of having my laptop open I have no need to recline my seat. Granted the business seat in front of me is unoccupied so it is not invading to my space. I was thinking of upgrading to business but I'm glad I didn't. The difference would have been in service only. The first row (12) of economy seating is for premium economy and has an additional fee. But passengers in this row still board last in zone 5 so getting spsce in the bins will not be easy even though you paid s premium. Other bad news for the row 12 window sests are that your outside leg will be hitting the business class side mount support in front of you with less of a footwell in front of you - requiring you to tilt your legs a bit to fit. Emergency Exit row seats board last, which means there is no room for overhead baggage. If you are a musician etc with delicate carry-on equipment, the Air Canada will display their renowned customer service and throw it in the hold anyway for a good bout of rough handling. "Preferred Seating" is garbage compared to Westjet, who board Exit seats firsta privilege that you are paying for. "Extra legroom" is minimal and possibly measured in millimetres by this airline. 18A and F (window) have 1/2 length armrests which are uncomfortable. Overall, I can't stand flying AC to/from LA, and were it not for the need to use up points, would fly WestJet every time. Of note Coach isn't worth it on this flight, even with points. Although the food service was pleasant and up to business class standards, calling this seat "business class" seems like a joke. The seat is cloth-covered, with a thin and uncomfortable seat and back. It is barely wider than coach--just has an extra-wide console between the two seats. And, it hardly reclines. After experiencing the suite-like business class seat on Air Canada's flight from Rome to Toronto, this seat cannot be mentioned in the same breath. I like your plane because it is very clean . Do not waste your money on Row 12! Curtain divides Business from Economy. There is no extra leg room and seat 12B does not receive a monitor for watching movies. Row 18 is the only worthwhile seat upgrade. These seats are terrible for the added money paid. Standard legroom, fixed arms, and the TVs are iffswt due to being behind business class without a dividing wall. Horrible seat and claustrophobic. Not extra room due to the non-reclined business seat in front..no wall just curtain. The position of the curtain is almost perpendicular to your legs creating a sense of wall in front of your face and even worst if the seat 4A and 4C recline. odyssey to get out of the seat on a 5 hours flight YVR-YOW. The worst seat row. Compared to the seats in newer planes that recline to flat, this is much less comfortable for a long flight. It didn't recline much, and I would not pay for this seat, as it seems only marginally more comfortable than a coach. unless you are particularly tall. 18C is in the second over wing exit row. This is pretty much a standard economy seat, but has very generous leg room. This is one of my preferred seats if/when I can get it. Agree with the user who said paying for a preferred seat was a mistake - this plane is so compact that the extra legroom on the exit rows is negligible. They felt to me to be a standard row that happened to have an exit at the end. If you are expecting extra room to breathe, you will be disappointed. This plane was configured with the corporate bottom line in mind rather than passenger comfort. Paying dor the preferred seats was a mistake. First the seats don't recline in row 17. Second this zone is last to load so by the time you board all of the overhead bin storage is full. Finally when the meal service starts those in the "preferred" seats are essentially trapped in their seats and unable to use the washrooms until the service is complete which can take considerable time. So be warned the preferred seats on the Airbus are a waste of money. I would go so far as to say they should be designated as "undesirable". 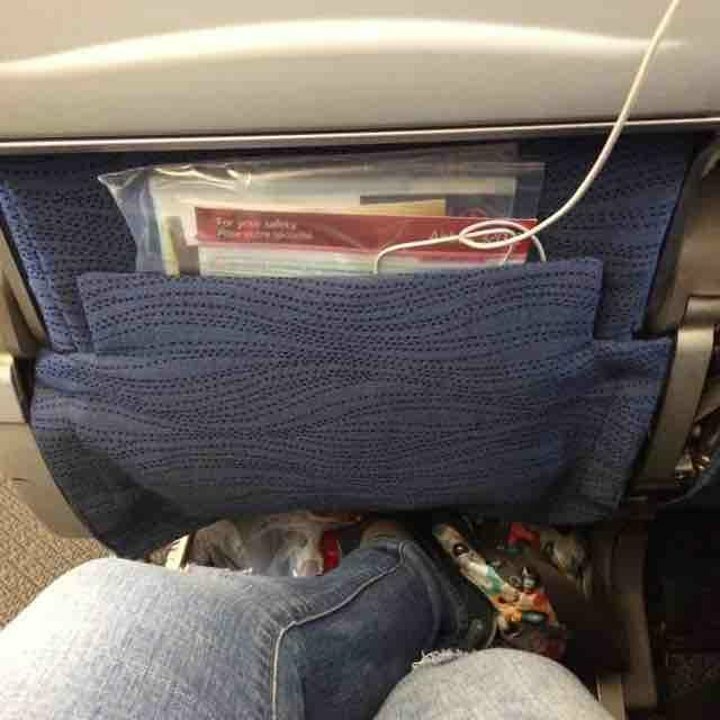 This seat was wonderful, great legroom and as always, Air Canada's entertainment system is top of the line. 90 minute flight. Leg room while not generous was acceptible - I'm 6'4" so legroom is a big deal for me. Seats were reasonably comfortable, again for a shorter flight. More lumbar support would be appreciated but nearly all airplane seats seem to ignore the lower back. Flight AC1208 from YYZ to PBI on the 24th of december of 2014. Flight leaving at 4:45PM at sunset. I was seating on 23F in economy class. Pros: Good boarding system made up with zones, but I would choose to fill the back of the plane first instead of the opposite. The seat was confortable, the extra inch of width (compared to the seat of an AC777-300) makes a huge difference in confort. The old media system works fine, but the content is not abundant. Cons: No food service. There are two drinks services with peanuts or a light snack, but the other food must be bought by credit card. I am a bit disapointed by Air Canada's decision to discard complimentary meal to save a very small portion of their total cost on US routes. These bucks are well spent for customer appreciation and for reputation my friends! Even a small sandwich/baguette would be better than just peanuts! Overall review: good seating, nice window view at sunset, no complimentary food for the price, good media. I arrived fresh for the start of my holidays in sum of all this time! The PA volume cannot be controlled by Flight attendants. Air Canada only offer frees snacks such as peanuts, cookies and pretzels on their RAPID AIR flights (aka short haul flights ex: YYZ - YOW) longer flights snacks/food are available for sale. I wouldn't recommend any to take any seats near the bathrooms. Always bring your own earphone/headphones to avoid the $3.50 rip off for those crappy earphones. Bring your own food/snacks while you're at it. Always check your entertainment system on the ground before the doors close, and if it does not work, ask a FA to reset it for you, otherwise you may be stuck with a long flight without IE. I hadn't flown for a few years (2010) and was very pleasantly surprised at the leg room and seat space provided by this seat. I like to be behind the wings in a window seat (love looking out) and was super comfortable. Frankly, I don't know why most people would even bother upgrading to 'preferred' given my experience. I am a woman, but not small5'8" and big boned as well as carrying 60 lbs. more weight than I should at age 72. Very large men or women (height/weight) might do better in preferred, but for the average to fairly substantial individual, this seat would be fine. I could stretch my legs straight, even with my fairly large personal carry-on under the seat in front. Hint for womenuse a cross-body bag and stretch the shoulder strap out to full length before you put it under the seat. I do that and loop the strap around my foot/ankle. That way I can always retrieve it during flight without awkwardness. Business class seats are not comfy. Not even leather seats!! IFE is brutal. The curtain in front and the issue in the arm rest makes this set of seat a hit or miss for some people. We did not like the seats, and we know some people who have actually asked a gate agent on their return flight to change their seat (even if they had paid extra for it). This seat is ok but you have business right in front if you with extra recline so it really evades your space. If u are in the middle seat you have a pull out tv so even less space. I didnt like this seat. Row 12 has no storage in front of you being that Business Class seats are in front of you. The PA can be VERY loud and the flight attendants won't turn the volume down even a bit, so avoid rows 29-30 if you're taking a night flight and plan on sleeping. Also, this aircraft is equipped with generous closet space, so if you're traveling in Y and have a suit/jacket to hang - just ask. Headphone jacks are standard ones, like in your phone, tablet, etc. AC doesn't give snacks! No peanuts, no cookies, no pretzels, nothing! Air Canada flies 1 versions of Airbus A320 Vers. 1.